Affordability is not always matched by rigorous safety for the world’s fastest growing air travel market. Some years ago, I took a domestic flight in India on one of the many new airlines that had cropped up over the preceding decade. The flight was on time and smooth, the food was good, the flight attendants friendly, attentive and courteous, their designer uniforms gleaming. All was fine with the flight ­– until we got off. Then, passengers were herded off onto waiting buses, which were locked and remained on the tarmac next to the plane for about an hour. It was clear something was going on, based on the stricken airline and airport staff that were scurrying about. Finally we were permitted off the bus and told what had happened: there had been a bomb threat while our plane was in the air. They had expected the plane to blow up while it was on the tarmac, and while we were locked inside the buses. It was a sobering reminder that while the new crop of airlines in India might look good, there were quite likely some i’s left undotted and some t’s left uncrossed. For all the shiny uniforms and chicken sandwiches on two-tone bread, they could not hide the glaring gaps beneath the veneer: a dire lack of preparedness for unexpected incidents. The Indian aviation sector is growing fast, but not exactly flying high. It is a story that is indicative of wider ills in the Indian aviation sector, which is growing fast, but not exactly flying high. 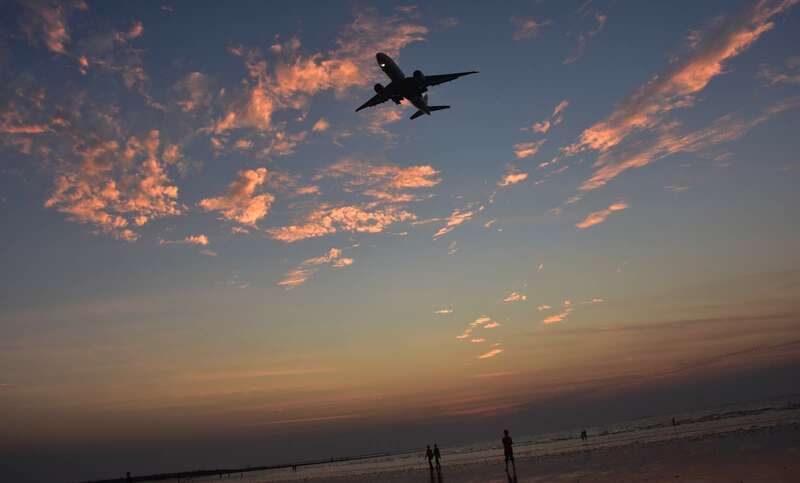 According to the Indian government, the country now hosts the world’s fastest growing market for air travel, recording double-digit growth in domestic air passenger traffic for the past three years. At the same time, most large airports are operating at capacity or close to it. And recently, the country unveiled its 100th airport: a domestic facility carved into the side of a mountain in the remote Himalayan state of Sikkim. But while passenger numbers are steadily rising, the combination of low fares, high costs, and a depreciating Indian rupee mean airlines are finding it hard to record a profit, or even simply break even. For example, the most popular of its many private airlines, IndiGo, saw its profits nosedive 97% in June this year. And more sky-traffic means more potential accidents. In 2016, there were 32 reported “near misses”, the highest number yet, and 90 over the past three years. A near miss is when two or more planes fly at the same height, or a flight descends to the height of another plane, and there is a lack of clear communication between air traffic control and the flights. And it doesn’t help when there are yet more reports of on-board safety issues. Just a few weeks ago, photos showing passengers on a Jet Airways flight from Mumbai to Jaipur in oxygen masks surfaced alongside reports that many onboard were bleeding from their nose and ears. It turned out that the airline crew had forgotten to switch on the cabin pressurisation. The photos were published widely abroad, and an already embarrassed Indian government just days later had to contend with another blow: the release of the annual International Civil Aviation Organisation (ICAO) report into air safety, which saw India slip down the safety rankings – down past Myanmar, Pakistan, Nepal, and even Bangladesh and North Korea. India now scores just 57% on the ICAO Safety Oversight Audit Program, which looks into whether countries have consistently implemented a safety oversight system. Last year it was at 66%. The low score does not bode well for the Indian aviation industry. Airlines could be downgraded by the US aviation regulator, the Federal Aviation Administration (FAA), which in turn could halt Indian carriers’ plans to expand, mount new flights into the US, or form alliances with US airlines. Any carriers which do already fly into the US could face more checks when they land. It should be pointed out that on the ICAO metrics, India performed well in terms of its operations and airworthiness, in these cases exceeding the global average. However, it was severely let down in areas such as licensing, where air traffic controllers have not been licensed by the aviation regulator, as per international standards. Such attention to detail is vital in an aviation market that is growing fast ­– too fast, some say, to adequately address all the many, varied and detailed safety needs and realities facing the aviation sector. A good place to start might be industry-wide protocols on dealing with bomb threats, including a plan on how to get passengers safely out of harm’s way.